The third molars, also known as wisdom teeth, generally appear between the age of 16 and 25 at the very back of the mouth. When they come through, all of the 28 adult teeth that grew years before are usually still in place: the surfacing of the four wisdom teeth can therefore be quite problematic since the space left in the mouth is already limited. This can cause the wisdom teeth to grow through with an angle, potentially causing masticatory problems. The teeth could also emerge only partially. Since the third molars are located at the very back of one’s mouth, they are very difficult to clean: this is propitious to the development of cavities, plaque and infection. Wisdom teeth removal is the action of completely extracting the third molars through a surgical procedure. Everyone has four wisdom teeth: two are located in the upper jaw (maxilla), and two more are located in the lower jaw (mandible). 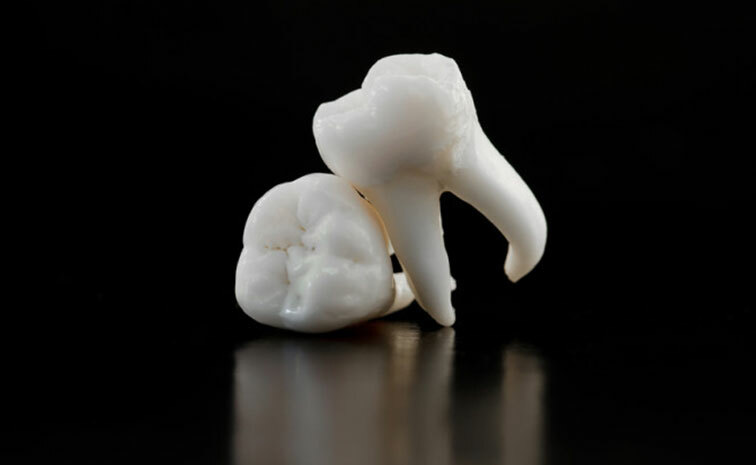 Their extraction occurs after digital X-rays have been taken to allow the dentist to see if the growing or the positioning of the patient’s wisdom teeth could be problematic. Early detection of malposition and subsequent removal can avoid serious problems. There is a certain protocol to follow with regards to wisdom teeth removal. When we extract a patient’s third molars, we want to limit potential secondary effects to a minimum. A local anaesthetic is always given to numb the teeth and the surrounding tissues: this allows the patient to feel no pain during the procedure. Sometimes, wisdom teeth have to be removed before they break through: in such a situation, the dentist will make a small incision in the gum in order to reach them. Discomfort and swelling following the surgery usually last a few days.